Homemade gifts are all the rage this year. Cookies in a jar are simple and economical. These three simple recipes are perfect! Looking for the perfect holiday DIY gift? Not only is this gift adorable, but it’s also perfect for the holidays! The best part about this gift is that it’s edible — no more gifts that just sit around. This gift can get thrown together, baked and eaten in just under an hour. Who wouldn’t love that? 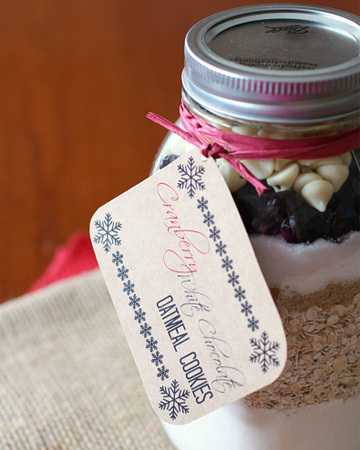 The best part is that you can customize your gift to use just about any cookie mix. Just add an instruction tag and you are set! Layer ingredients in the order listed above into a clean 1-quart Mason jar. Make sure to pack down each layer before adding a new layer. Tip: It’s easy to add ingredients into a jar if you use a wide mouth funnel. Preheat oven to 350 degrees F and melt 1/2 cup butter in a microwave safe dish. Let butter cool slightly and add 1 egg and 2 teaspoons vanilla extract. Pour in entire contents of jar and mix well. Shape into walnut size balls, space 2 inches apart on a cookie sheet and bake for about 12 minutes until slightly brown. Enjoy! Layer ingredients in the order listed above into a clean 1-quart Mason jar. Make sure to pack down each layer before adding a new layer. Tip: It’s easy to add ingredients into jar if you use a wide mouth funnel. Preheat oven to 350 degrees F and empty cookie mix into bowl. Add in 3/4 cup softened butter, 1 beaten egg and 1 teaspoon vanilla extract. Shape into walnut size balls, space 2 inches apart on a cookie sheet and bake for about 12 minutes until slightly brown. Enjoy! Preheat oven to 375 degrees F and beat 3/4 cup room temperature butter, 1 large egg and 3/4 teaspoon vanilla extract in large bowl. Add cookie mix, blend and drop tablespoon-sized balls onto baking sheet. Bake for about 10 minutes until golden brown. Enjoy!